When I was a kid, my dad and I would go to an old farm near Hawkinsville, Georgia and just go hunting. We never planted a food plot or put out any feed, yet each year we harvested enough quail to include on the menu for the family Christmas dinner. So why do we need to provide feed sources for quail today? There are many factors that I could bring up, but let me briefly touch on two : high deer populations and sod forming grasses. 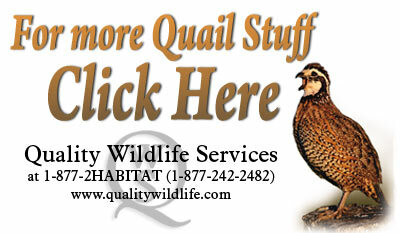 I have been managing quail properties in the southeast for many years. Here it is common for me to see a proliferation of seed producing plants emerge during the spring on acreage that was control burned the previous winter. During the summer months these same plants are browsed heavily by deer. Though there is still seed production for quail, it is greatly reduced. 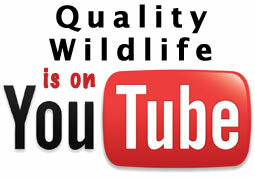 This is Quality Wildlife’s first video, which gives a great overview of the history Quail Management, and reviews their products as well. We have included a short section on the history of Quail Management. This DVD is included with the Covey Base Camp and available to anyone interested in learning more about our release system and products. Recently, a client of mine said to me,“Jim, I have two questions for you. First, are my early release coveys running off the native birds? And second, can released quail reproduce?” These are probably the two most frequent questions I have had come my way during the past thirteen years of working on pre-season release quail projects. Whats really going on? Who are the real Survivors in the quail game? Dr. Tom Eleazer received his degree of Veterinary Medicine from the University of Georgia in 1958 and served Clemson University as a veterinary pathologist, studying poultry and game bird diseases for 31 years. Tom is still actively applying his skills as a poultry and game bird disease consultant. In the past he has served as president of the South Carolina Wildlife Federation, served on the advisory board for the Institute of Wildlife and Environmental Toxicology, and also as a member of the Wildlife & Freshwater Fisheries Advisory Board for the South Carolina Wildlife Commission. He was also instrumental in the development of the vaccine for “quail pox”. Now lets hear what he has to say about the question: Are pen-reared quail a disease threat to wild birds? Over the years I have had the opportunity to work with many landowners that were devoted to having quail on their property. Questions about feeding quail seem to always arise at some point during my visit. For this reason I thought I would take a few minutes to share some thoughts with you on the subject and why for many of us, supplemental feeding is a necessity. Why do we even need to feed quail?As a youngster, my father and I hunted quail and never had to plant a food plot or put out any feed. The farms we hunted had residual crops scattered along the field edges and food never seemed to be factor. But I can also remember, during one of those hunts, when he took the time to show me the track of a game animal that was just starting to become re-established in the region it was a deer track.Today you could leave half the crop in the field and still have nothing left for quail because the deer would have eaten it all. Also, deer browse on many of the native seed producing plants. This activity further reduces the abundance of natural winter food sources that quail need. In a situation like this, supplemental feeding is critical to sustain a winter quail population. Ok! It’s time to drop the tailgate of your truck and let me sit down with you for a few minutes to talk about what happens at a quail feeder during the course of a year. After we get finished, you may wish to review another article I wrote called, Methods of Feeding Quail . 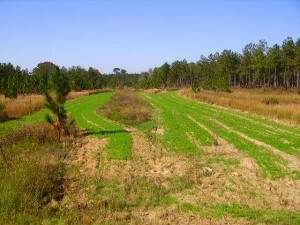 It discusses several ways to provide feed for quail and reviews the the role of food plots, the methods of spreading feed, and the use of feeders. Many years ago, as a student, I remember listening to one of my wildlife professors lecturing our class about some of the animals he had worked with in the arid regions of Africa. He showed us a picture of an Oryx antelope. This critter has long sharp horns, weighs about 400 pounds and looks as if he just came out of a Dr. Seuss book. When I was a youngster, my father and I would just go quail hunting. The culture was different then. The crop fields were generally smaller and surrounded with hedgerows. Because deer were much less abundant, residual crops left after the harvest were available to small game. A strong trapping market kept predator populations in check, and winter burning was just a normal occurrence. All these factors combined to create a “quail friendly landscape”. Intergrating deer food plots in quail management.